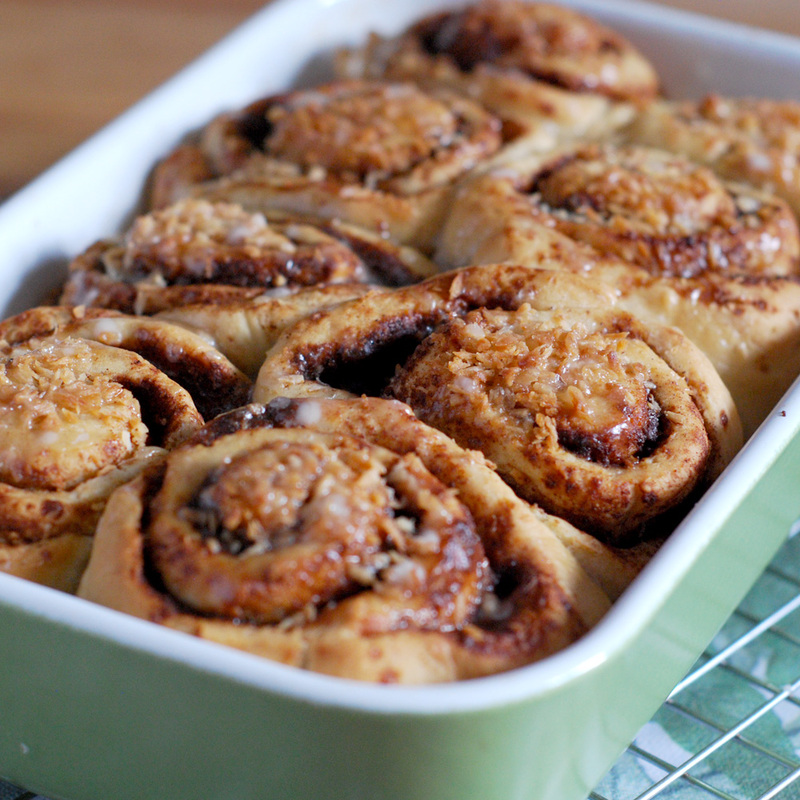 I absolutely love cinnamon roll and coconut, so I’ve decided to combine both and the result was a soft, fluffy, sweet, comforting, delicious roll. We had most of it while still warm with peppermint tea. Quick tip, if you are not sure where to leave the dough while proving, turn the oven on at 180C for a few minutes and put the bowl in there with the door slightly open. So here goes the recipe. In a saucepan heat the milk plus 2 tbsp margarine in low fire until the margarine has melted. Let it cool down to lukewarm temperature. Transfer it to a big bowl, sprinkle the yeast and let it rest for 10 minutes. Add in 2 tbsp sugar, salt and stir lightly. Add in the flour, 1/2 cup at a time and mix it with a wooden spoon. When it’s too difficult to stir, using your hand work on the dough until all the flour it’s incorporated plus 2 more minutes. Transfer the dough to a clean, oiled bowl, cover it with cling film and let it rest for 1 hour in a warm place. The dough should double in size. Open the dough in a floured surface into a thin rectangle. Melt the rest of the margarine, brush most of it on top and sprinkle the rest of the coconut sugar, cinnamon and 3 tbsp desiccated coconut. Roll up dough and cut it using a bread knife into 10 rolls. Transfer the rolls to a greased rectangle baking tray (a brownie tin should do), brush the rest of the margarine, sprinkle the rest of the desiccated coconut on top and let it rest for another 45 minutes. Bake it for 25 minutes on a pre-heated oven at 180c. Mix the ingredients of the glaze and pour it on top of the rolls while still warm.